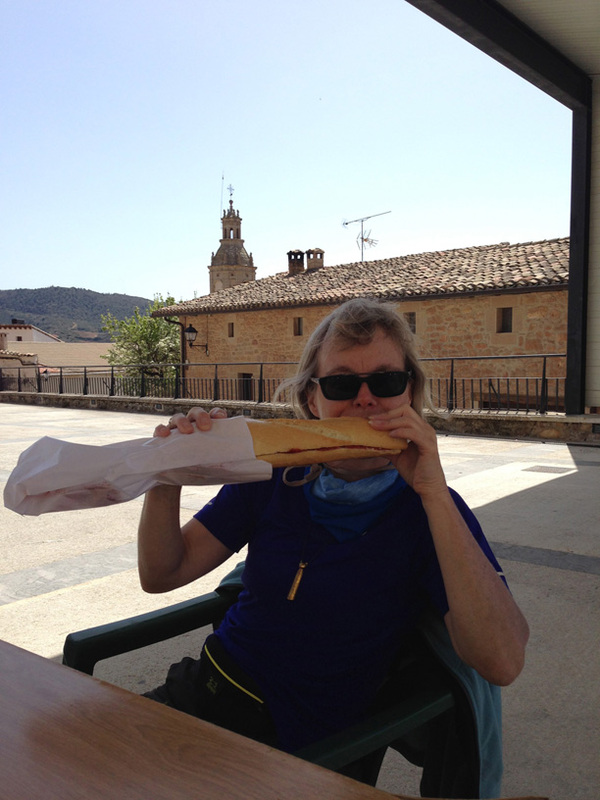 Yes, that was me while traveling through much of Spain along the Camino de Santiago. Many of the little cafe bars – especially in Basque Country – would frequently have Pepsi signs on the outside, but no Pepsi on the inside. 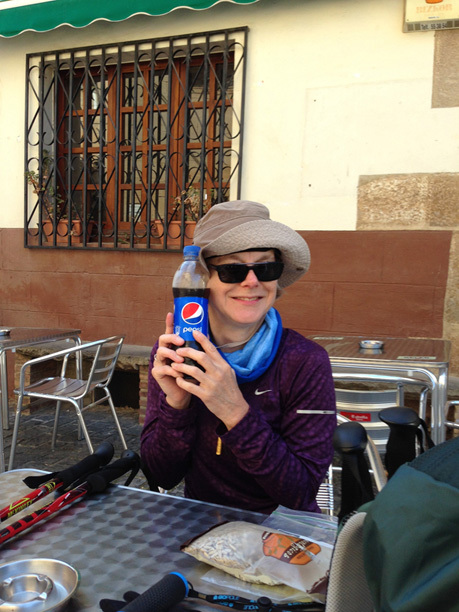 Here’s me enjoying one of my few treasured bottles of Pepsi I did find along the way. So frequently…okay maybe more than frequently…I would choose beer instead. (I saw the word “biere” far more often than “cerveza” which many Americans are more used to.) It’s quite easy to get used to drinking beer for lunch AND dinner. But I most certainly did enjoy my morning tea with its companion croissant. 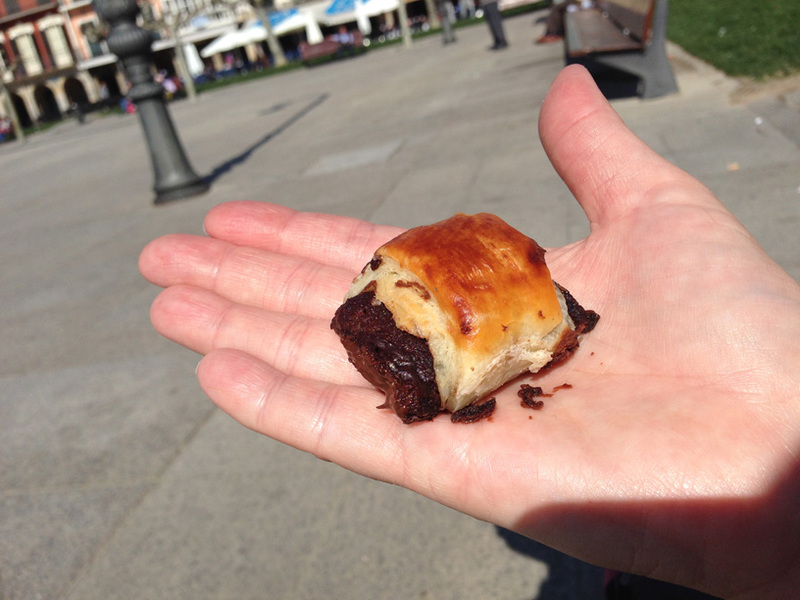 I just wish I could remember where it was I ate the most delightfully freshest croissant I’ve ever had in my life. I have to admit I developed a love/hate relationship with the food along the trail. I think experienced peregrinos will know what I mean: the Pilgrim’s Menu. Designed to be fuel for the trail, there were a lot of carbs and a lot of protein. And the choices can get rather repetitive. One of the items I never want to see again is a bocadillo. What is a bocadillo, you ask? A huge hunk of bread with some form of pork between them. See how that sandwich is almost as big as I am? There were, of course, some really good bocadillos on really fresh bread. And then there were some stale ones, like the one in the picture on the right. Did I mention that you get french fries with almost every meal? And fried eggs too? (It must be the horror writer in me that caused this Freudian slip: when I looked at my trip notes just now, it said “fried eyes”) Ha! Hey – I could use that in a story. Hmm…do you think Hannibal Lecter would ever want to eat a zombie’s eyes or eat a zombie’s brain? But I digress. The fried eyes…uh, I mean eggs, have followed me home. They’re now finding themselves topping foods I’d never before considered combining them with: a nice filet mignon, a glob of chili over a bed of rice, a basket of french fries. Oh – there’s those french fries again. But back to the beer. I much preferred the San Miguel brand to Cruz Campo which was served on Renfe (the trains) and in Barcelona. 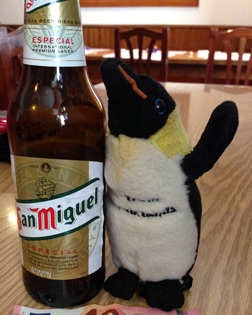 As you can see, #PenguinAboutTown also preferred San Miguel. 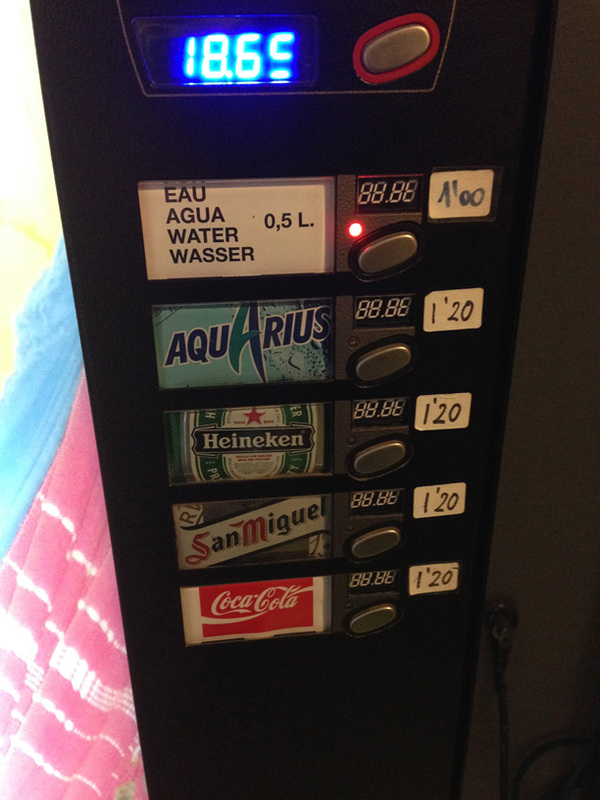 And both of us were delighted to find that Spain is such a civilized country they offer beer in vending machines! But…sigh…no Pepsi. My dislike for the bunk beds was only exceeded by my even more quickly developed dislike for the large municipal albergues. All those people crammed into those space (even if divided into separate rooms) generated a noise level which sets my nerves on edge. And I’m not even talking about the snoring, which wasn’t as bad as I’ve heard. I mean the general noise level of all the conversations reverberating through the spaces until “lights out” (especially bad at the Jesus y Maria albergue in Pamplona). So we developed a strategy to avoid the larger hostels, even if it meant rearranging our intended distances/destinations to stop short (or go ahead) of the major cities: a strategy I highly recommend. I very much enjoyed the smaller, privately run albergues which facilitated more intimate interactions with our fellow peregrinos, to include more enjoyable communal meals and smaller common rooms to sit around and chat. In Viskarret, we stayed at Corazon Puro, run by a lovely Hungarian couple. Me, Xina, and Emelia (from Denmark) were the only guests. We had a lovely meal, prepared by Barbara who joined us for dessert and conversation. In Larrasoana, we stayed at the San Nicolas albergue, which had only been open for ten (10) days! Brand spanking new! We enjoyed another delicious meal and conversation with peregrinos from a number of countries. Some of these same peregrinos we would run into again and again at different stages, including Emelia. By the way, put together two tables of travelers (from places ranging from Canada, Brazil, Germany, England, Denmark, Sweden, Hungary, France, Italy, Japan, Korea, etc.) and what language is everyone speaking? English. In Obanos, despite being in an albergue (Usda) with more than 20 beds, Xina and I were the only guests – quite nice to have a place all to ourselves. (Most people continue on to Puente la Reina, but we were tired and stopped short.) 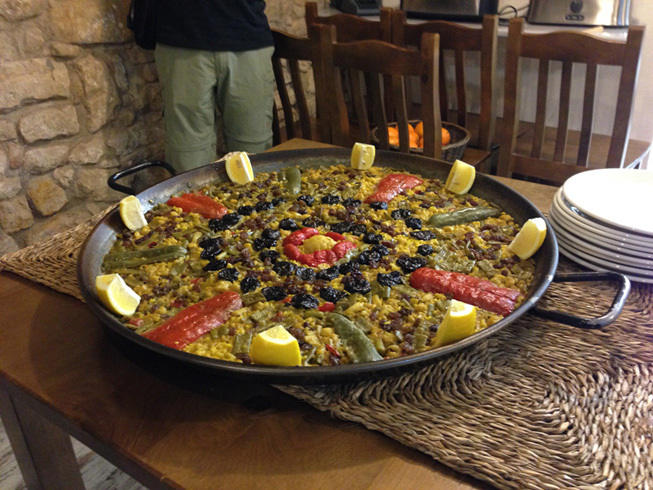 In Villatuerta, we stayed at Case de Magica, known for its vegetarian meals. This is where the first included photo is from. See: no bunk beds!! In Los Arcos, we stayed at Casa de Austria, welcomed warmly by Julian, a hyperactive 20-something from Germany – and very nice! They didn’t have a kitchen, but there were numerous cafes within easy walking distance even for me (this was the leg during which I suffered my initial foot injury). One of the amusing happenings on this leg was again running into Guy, from Montreal, at the municipal albergue when we went to pick up our bags which we’d had shipped ahead. He was sharing a snack with a young man out on the porch, and when we confirmed just how nice San Nicolas was, the young man made a choking motion toward Guy. Why? He thought Guy was exaggerating about its amenities and, after suffering through the municipal albergue in Larraosoana – reportedly even more horrible than we had been warned – he was very annoyed to find out that Guy was not exaggerating. Lesson learned: don’t stay at that place! In Ventosa, we stayed at San Saturnino run by an older woman who seemed rather stern – at least at first – but she warmed up to everyone in the morning and was more talkative. San Saturnino had a wonderful central courtyard and was beautifully decorated. We did stay at the municipal albergue in Azofra – which doesn’t stick out in my memory for some reason. And, of course, I can’t say enough about Divina Pastora in Burgos. It’s very small (only 16 beds), but it’s quiet, intimate, and Alicia (the hospitalero) is sweet, kind, and caring. It’s located above a small church near the cathedral and one does wonder if he/she might have made a mistake choosing these accommodations upon feeling the church bell clanging the hour (yes, it actually vibrates through the structure), but the bell does not ring during the night so you can sleep peacefully. 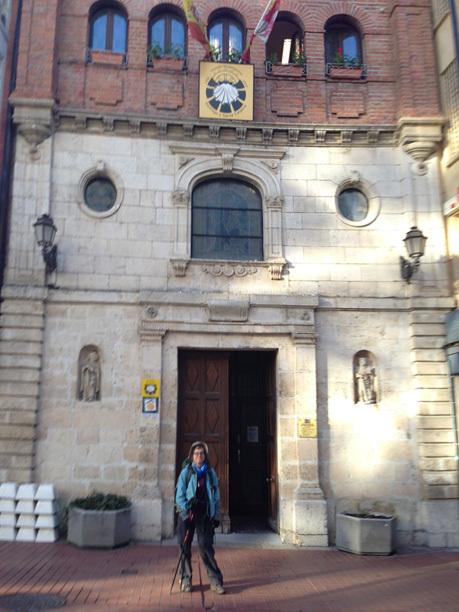 I look forward to returning to the Camino, starting in Burgos, and hopefully getting a bed at Divina Pastora. In Obanos we asked an older gentleman to point us in right direction. He didn’t just point; he walked us to the edge of town, chatting as best we could in our mangled Spanglish. In Villatuerta, at La Casa Magica, the receptionist extinguished the incense burning in the lobby when my friend explained that I am allergic to it (and can get serious migraines) and then walked me up to the rooms via the back way to allow time for the incense smell to dissipate. In Los Arcos, the owner (we think he was the owner) of Casa de Austria made wire art of our names while we sat, chatting and enjoying a drink in the common room. My two favorite hosts: Alicia, who runs the small Divina Pastora albergue, and Tony, the receptionist at Hotel Alda Entrearcos, both in Burgos. Alicia I can best describe as a woman who is confident and secure in her faith and her duties to care for the peregrinos who pass through her doors. She played her guitar and sang for us in the morning (“Buenos Dias Maria”) as a gentle wakeup call. And, upon our leaving that last morning and seeing how upset I was about having to quit and return home, she gave me a big hug and told me she’d see me next year or the year after when I return. Tony was equally gracious, although I didn’t find that out until later. I had stayed at his hotel my second of the three nights in Burgos as a break from the constant socializing within the albergues and was then surprised to see him walk past me in the Burgos train station. He recognized me instantly and said hello, seeming quite surprised that I wasn’t back on the pilgrim trail. When I explained the situation to him, he insisted on buying me a cup of tea. We sat and chatted for awhile, and I learned that he and his wife had emigrated from Romania, looking for better job opportunities, and are happy to be raising a five-year-old daughter named Christina in Spain. The two work in a couple different hotels and commute back and forth. As we parted ways, he walked me up to the train platform and made sure I got on the right train to Barcelona. It is kindnesses like these that make me look forward to returning some day to finish the Camino. While Xina is getting close to the finish line without me, I know that I have a couple friends and relatives who would like to do the Camino in the future. It will be a pleasure to share the experience with them. My stupid foot has gotten the better of me. Even after three days of rest, I can only walk for about an hour without pain. And then it’s limp, limp, grumble, grumble. Not sure if the toe is actually broken but it sure feels like it. The nail is steadily turning black. Certainly the Camino gives your feet a beating, but I think the source of this problem may have pre-existed. Back in January, I had the nail of the right big toe removed because it was infected and ingrown (extremely painful). Despite being only partly protected by still-growing replacement nail it has given me no problem. 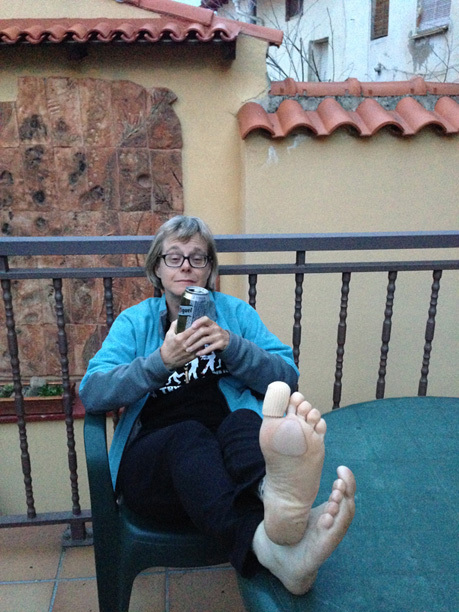 At the time I did not ask the podiatrist to examine the left big toe. While it had shown some of the same problems as the right it looked and felt normal in January. That may have been a mistake and now I’m paying the price. It has affected the whole toe, and so the whole foot which has become prone to swelling, throbbing pain, and occasional sharp jabs of pain (even while I’m sleeping). 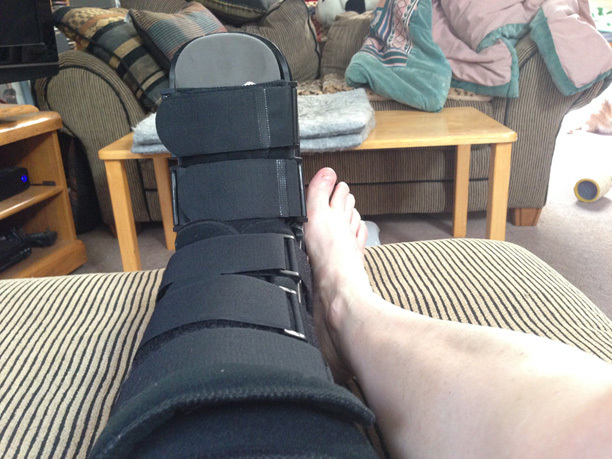 Granted – there may be more to the story than just a bad toenail. Who knows. Maybe the day I nearly turned the ankle (only our second day on the trail) is also playing a part. The rock that was tripping me up moved just enough in the right direction that my foot and ankle popped upright just in time. I thought. Attempts to see a doctor in Burgos ran afoul of the requirement to sign a promissory note to guarantee I would cover all expenses…without being told what those were. (Spain has socialized medical care. No one knows how much anything actually costs.) And my emails back and forth to my insurance company couldn’t get a concrete answer as to whether I would be reimbursed. A toe isn’t exactly a life-threatening emergency. So here I am back in Barcelona. Wish me luck trying to reschedule a flight home to the U.S.
Here’s a tip for your Camino: if you think something might be wrong with your feet get them checked out before you go. And if you have a history of ingrown or infected toenails, have them removed at least three or four months in advance. Scattered throughout Camino guidebooks you will see the authors extol the virtue of natural paths versus the hard cold cement and asphalt interspersed along the Camino wherever it crosses cities. Uneven dirt tracks filled with varying layers of rocks, gravel, and pebbles — all of which prevent you from placing your feet evenly on the ground, thus increasing the strain on your knees, ankles, and toes. But don’t get me started on the toes. More on that later.